Urban Spacemen & Wayfaring Strangers: Overlooked Innovators and Eccentric Visionaries of '60s Rock is a 300-page book (Miller Freeman, $22.95) with in-depth profiles of nineteen fascinating cult rock artists of the 1960s, in all cases including first-hand interview material with the artists themselves and/or their close associates. Lost British Invaders, psychedelic pioneers, rock funnymen, blue-eyed soulsters, overlooked folk-rockers, behind-the-scenes producers -- all find a home as part of Urban Spacemen & Wayfaring Strangers,with a foreword by Paul Kantner of the Jefferson Airplane. The follow-up to Unknown Legends of Rock'n'Roll,this book does not duplicate any of the artists selected for that prior volume. Additionally, each of the twenty chapters runs about three times as long -- 5,000 to 15,000 words! -- as the average chapter in Unknown Legends,allowing much greater space for in-depth investigation of each acts. 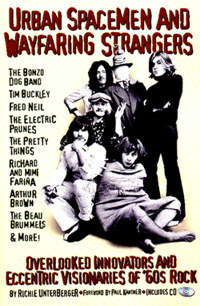 The book also includes a CD with tracks by several of the acts covered in the volume. The text is accompanied by photos and reviews of the most essential recordings by each artist. Transcripts of interviews done for Urban Spacemen & Wayfaring Strangers.Exclusive to this website! Urban Spacemen & Wayfaring Strangers: Overlooked Innovators & Eccentric Visionaries of '60s Rock is widely available at both independent booksellers and chain bookstores throughout North America. To order on-line via amazon.com, click on the book cover below.